Peaktop POL-0001C Glass Fountains, Multicolor | Fountain City Art Ctr. 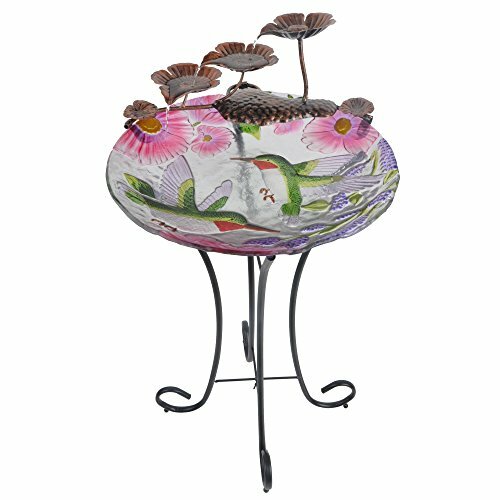 The Hummging Bird Glass Fountain is a great way to give back to our wildlife friends. Decorate your garden or yard with the eye catching beauty. and attract many exotic beautiful birds to come relax as they listen to the calming. free flowing water throughout the fountain. Made from bright colored fusion glass pieces with beautifully designed pattern and quality powder coating steel. A versatile gardening and landscaping piece, this waterfall fountain can be used in house, patio, or garden. UL/CUL listed 120v Pump included. 18.00L x 18.00W x 35H. 14.33lbs. Fountain includes a UL/CUL listed pump (Model#: PT-1020) that circulates the water. Alpine MAZ252 6 Leaf Tier in Rotational Pattern Floor Fountain, 37"